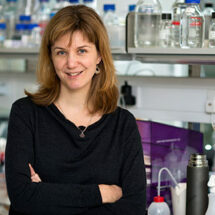 Wanda Kukulski, group leader in the LMB’s Cell Biology Division, has been awarded the Royal Microscopical Society’s Alan Agar Medal for Electron Microscopy for 2019 for her work in the field of Correlative Light-Electron Microscopy. The Royal Microscopical Society launched a series of medals in 2014 to coincide with its 175th anniversary and awards these medals every 2 years. The Alan Agar Medal for Electron Microscopy recognises and celebrates an individual for their outstanding scientific achievements applying electron microscopy in the field of physical or life sciences. Wanda’s work at the LMB involves the combination of light microscopy and electron microscopy, with the obtained data being overlaid. These techniques allow Wanda and her group to study the way in which the architecture of cellular membranes contributes to different processes. Cells have membranes that separate different compartments within the cell as well as forming the barrier around the edge of the cell, but, importantly, cellular membranes are not just inert barriers. Their compositions and shapes vary depending on localisation and task within the cell, and are changing accordingly. These dynamic changes are an integral part of their functions in processes such as transport within the cell and communication between different compartments. Indeed, defects in the systems that control membrane architecture are linked to human disease. Using these microscopical techniques, Wanda’s group aims to gain an understanding into how the structures and compositions of internal membranes are organised during different cellular processes in order to learn about the fundamental mechanisms required for many cellular functions. Wanda will receive the award at the Microscience Microscopy Congress in Manchester in July 2019. John Briggs, a group leader in the LMB’s Structural Studies Division previously won the Royal Microscopical Society’s Medal for Life Sciences in 2015.